Okay, here is the recipe for Slow Cooked Oatmeal that everyone is asking about. 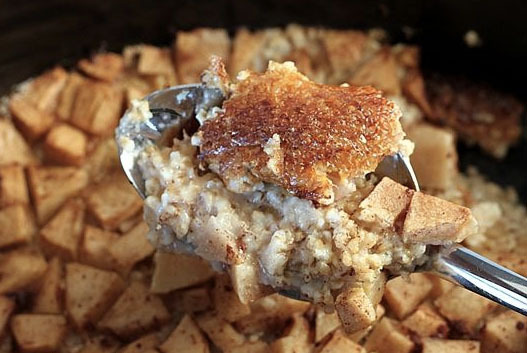 This is the easiest recipe and makes a delicious oatmeal that is more like a bread pudding. Talk about having super food ready for you in the morning and low in calories. Oh, and it is outrageously easy to make and your family will love it. Directions: Heavily spray crock pot with Pam or other cooking spray. 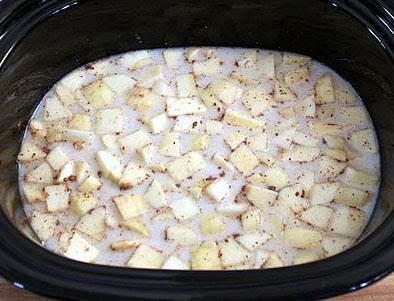 Peel and Chop apples and add all ingredients except chopped walnuts into the crockpot. Combine until mixed. Apples will rise to the top. Cook on LOW. Very important, do not cook this on any other setting but LOW. I usually start this before I go to bed and it will be ready when I wake up in the morning. The apples are and tasty and the oatmeal is so full of flavor. The slow cook process breaks down the sugars in the apples and in the raisins or craisins so you don't need a lot of sugar in the mix. Fill your bowl and top with walnuts or pecans or diced dates. My honey and I enjoy this so much that we have it for dessert with vanilla ice cream and fresh whipped cream. For a more adult variation, soak the raisins or craisins in brandy and then add to the oatmeal. I make this two nights in a row so I can put some up in 1/2 cup plastic bowls and freeze so I can grab it and nuke it whenever I want it. Shot this photo of raked leaves in my neighbor's yard as I was walking to visit my sister. I love the soft colors of these raked leaves. Had lots to do this weekend so no treasure hunts for me. Still, I hit my local Goodwill to drop off some items and then made a quick run inside to see what was available. I hit the jackpot with a series of Revere ware bowls all taped together. Two were large pieces, Reed & Barton quality silver plate with clear liners. These must have been wedding gifts because they still had the blue foil label on the bottoms, no scratches and in perfect condition. One is a 12 inch diameter and the other an 8 inch in diameter bowl. But the best Revere bowl in the lot of three was a small, 6 inch in diameter bowl that is marked Sterling. Yes, Sterling and approximately 113.5 grams. I couldn't believe it. A vintage piece by Fina from the 1970s. This sweet little Amber piece from the 1960s. Perfect for a Thanksgiving table. I've been a very busy girl. Yup, I've been a very busy girl these last 10 days. Antiquing in North Georgia and locally, putting up pumpkin for pies and making pumpkin pies and bread, preparing slow cooker oatmeal, and restocking and resetting my three booths in at Queen of Hearts. Whew, I'm a little exhausted just posting this. Let's start with pumpkin pies, shall we. I lived in Lancaster County, Pennsylvania in the mid 1970s and there is where this city girl learned to prepare pumpkin for pies. Nothing like learning at the hands of farm women. These are neck pumpkins which look like gynormous crook neck squash. The thick necks are pure meat and offer the bulk of this tasty pie filling. The traditional way to prepare pumpkin mash is by slicing it up and boiling down. You then mash and then drain the excess water from the pumpkin. This could take days and is labor intensive. I'm a slowcooker gal. Love the way it prepares food without fat and keeps meats juicy. So I skinned and chopped and filled my crock pot with half of the first pumpkin. Put the slow cooker on low and went to bed. The next morning, the pumpkin had cooked through soft and I poured off about 4 cups of liquid. Like potatoes, this cooked pumpkin is easy to mash but I like to run it through the Foley Mill which mashes the pumpkin to the perfect consistency for pies. This slow cooker process was such a great way to prepare the raw pumpkin and no waiting to drain off the excess liquid over a few days. A freshly made pumpkin pie. Apologies for the use of a frozen crust, but I just didn't have the time to make a homemade crust. LOL Heaven, this pumpkin pie is so tasty and rich with flavor. In between making the pies, I had a great two weeks of finding treasure. So let me share a few pics of what I found; this first group of items were purchased in Jasper, Georgia. Pretty English biscuit tin from England, Circa 1960s. These are a popular item and I always sell well. I love American basketry and this lovely, split hickory market basket is a winner. I kinda fell in love with it so it is going to live with me for a while. Popular with cigar smokers, this wooden cigar mold is in great condition. I love weird pieces and these three pieces of wood banister finials just kinda stacks nicely. I removed the top piece and will put a pillar candle in the other two stacked pieces and come up with another idea for the top piece later. Lovely pair of turn of the century prints in Victorian frames with bubbled glass. Pretty, milk glass finger candlestick. Sweet Victorian piece. Cool agricultural sign touting the quality chickens in Cherokee County, GA 1955. Okay, so this cute little box is not really old, but it has a Mermaid on it and you know I have a soft spot for anything mermaid. Now for the treasure I found locally this past weekend. Sweet, medium size ironstone pitcher. This exquisite pair of civil war era hand tinted prints in lovely wooden frames. These are big illustrations as well. An even earlier print, dated 1837, also hand tinted in original frame with bubbled glass. Lovely etched nappy in heavy silver plate. An early Rogers piece from the 1900s. Two nice pieces of cathedral glass window pieces. These are small and probably side or transom glass. Love the fall colors on this one. Lovely little cut crystal perfume bottle with faceted stopper. Everybody loves Turkey plates and platters. This Staffordshire piece is a rich purple transfer ware piece. Not very old, but sassy just the same. Gotta love this terra cotta turkey. perfect for a harvest table. How cool is this huge metal scoop with turned wooden handle? This is a nail scoop from a hardware store. Before Home Depot and Lowes existed, if you wanted nails, screws, nuts and bolts, you went to your local hardware store and bought them by weight. And these three vintage mixing bowls. One is a McCoy, the rest are USA. All show the crazing of age but you know they were the start of some great kitchen treats. The smallest is about 5 inches in diameter. Spent most of Sunday rearranging my three booths to get ready for the holiday decorating and setup. Will begin setting up for Christmas right after Halloween. The Victorian booth is packed and it looks good. My new booth neighbor put up this permanent shelf and they said I could use the back that faces into my booth for hanging items. I love booth neighbors like this and the new wall space gives me a great backing for pictures. Redecorated the oak mantel with Halloween items. The left corner of the booth. It was a lovely weekend...wait, let me say it again, it WAS a lovely weekend. My honey and I ran away for two days to play in the North Georgia mountains. I so needed this and didn't realize how badly I did until we hit the road. A more beautiful day we couldn't have requested. Brilliant fall blue sky, warm weather with a gentle breeze and the leaves are changing colors. Perfect. We meandered through back state roads to Etowah Valley Sporting, in Dawsonville, so my honey could shoot a round of sporting clays before we headed to Jasper. Lots of shooters had the same idea. Some brought there sweet and well trained hunting dogs who were adorable. Most of the walk areas were littered with acorns, branches and fallen leaves. Such a pretty carpet of natures best. Sporting clays is kind of like golf only with shotguns. You travel from stand to stand using a golf cart and each stand is set up for a different type of shoot. Each location has a great or interesting view but my favorite was station 7. An old pickup truck, you stepped up into the bed and shot over the top at the two clay birds that would fly out. This pretty butterfly was resting on this tree root. Even the crushed granite and marble driveway had fall dropped all over it. I like the burnt orange and browns of the leaves against the greys. Following the shoot, we grabbed lunch at the local Mexi-restaurant for a light lunch and then headed down the road towards Jasper. Jasper has a marvelous selection of antique shops and a local flea market. We hit the flea market first, very small, very ... how shall I say ... stuck in the 1980s. Small trailers with bad flooring and wet smells and filled with items that seemed from the 1980s. Think ceramic geese for the kitchen and lots of plastic bracelets and ugly little straw wreaths. Still, there was one tailgate that had a few items that were interesting and I walked away with three pieces. We entered the old business district area of Jasper and the first antique shop we found was Junktiques. An inviting little home that was filled with great pieces and excellent prices for both the dealer and the collector. They also had a little shed out back that was filled with Americana primitives. Junktiques carries a lot of decorative and usable furniture pieces and great prices. If you are looking for items for your home, this is a great place to start. Birdhouses are loved by southern folks and the South always seem to have the most interesting pieces. From a country church to Americana clapboard homes, you will want each and every one. Now here is a lamp my honey would enjoy reading by. Vintage piano sheet music. When I saw the title, I immediately started humming the tune. I found a few neat pieces here as well. We moved on to Nana's Out Back which was just two blocks above Junktiques. Another inviting old home filled to the brim, top to bottom and every nook and cranny within. Nana was outside sweeping the back entrance and with a wave and hello I was welcomed into her shop. Room after room after room was filled with treasure. The garden room was pure delight. The kitchen was filled with beautiful depression glass and vintage kitchen items. A corner wall was filled with wooden displays and so many interesting smalls. How clever is this repurpose? They used vintage belts as woven material for a seat. Sturdy and tight, this is so clever and if a repair is ever needed you are just a belt away. Nana's had marvelous post Civil War pieces as well. Fell in love with a gorgeous Civil War era nursing chair and this beautiful oil in monotones. Purchased a few items from Nana too. From Nana's we drove to Golly, Miss Ollie, same road, just a little farther away. Miss Ollie's is a mix of antiques, garden and new gift items. A one stop shop that if you are looking for a gift item for someone, you will find it here. Prices, though, are higher than expected due to consignment pieces . Lots of theme rooms and beautiful, handmade Santa Clauses in every type of design. A basket full of beautiful canes with deer horns as handles. In the back was a Christmas themed room that was filled with these marvelous Santa's. Small and very large, they are all one of a kind. My favorite piece in the shop was this lovely American wall desk. It was now almost 6 in the evening and we needed to check in at the Woodbridge Inn. Located in the foothills of the Blue Ridge Mountains in Jasper, Georgia, this Inn is a hidden gem. Their water tower marks the spot and can be seen from town. From the town's main street you then drive across the old railroad bridge to the entrance. Such a marvelous sound as you drive slowly across the bridge. Entrance to the Woodbridge Inn. Owned and run by award winning chef, Hans Rueffert, his story is an amazing one. A chef who has lost his stomach due to stomach cancer, his story is uplifting and demonstrates the passion and love one has for their craft. The art sculpture at the entrance is dressed with pumpkins and brilliant red geraniums. More happy geraniums are placed along the stone entrance. Look carefully at this geranium pot...there are plum tomatoes growing with the geraniums. How delightful. There is a nice pool outback and leave it to this Sea Witch to find water even in the mountains. It was closed for the season and my honey and I decided we need to come back next summer to enjoy the pool and the Inn again. a 3 Course Dinner for Two. Rooms overlook the North Georgia mountains and our pretty little deck had a pair of rockers waiting for us. We relaxed for a few hours on the deck with a drink and conversation before we left for our dinner reservations. A change of clothes and we walked to the restaurant for our 8:00pm late supper. Pretty lit candles could be seen through the windows and the restaurant was full. The Woodbridge Inn is a family owned restaurant with a German heritage. Everything about the Inn is clean, inviting and artsy. I snapped this photo earlier in the day. We were greeted at the door by a lovely woman who brought us to our table. I cannot say enough about the attentive staff at Woodbridge. Everyone, and I mean everyone, was friendly and welcoming and truly made it their job "one" to ensure that your dining experience would be memorable. Our waiter, Derek, was attentive and friendly and had a running banter with my honey the entire evening. Easy going and with a great sense of humor, Derek enhanced our meal experience. Each table had a plate with sesame crackers and a ramekin of imported cheese spread. With three courses to select from, my honey ordered the Onion Soup while I had the icy cold spinach salad. The French Onion Soup Gratinée. Rich and full of flavor, this is an Inn favorite. The Inn comes with a German history so I had to have the Wiener Schnitzel. Thin, fresh veal cutlets are sauteed to a golden brown on a bed of homemade spaetzle and a side of Bavarian red cabbage. An outstanding dish in every way. My honey had the Filet Mignon Forestiere. Grilled, lean Black Angus beef served with sauteed mushrooms and fresh baby carrots. Cooked medium rare to perfection, you could cut into this with a fork it was so juicy and tender. Our third course was a selection from the dessert menu and we chose the Bananas Foster for the table side show that comes with it. Prepared at your table, the staff works the ingredients over a blue flame until the bananas are saturated in the sugar, cinnamon, butter and lemon confection and then they add rum which bursts into a giant flame. Within seconds it is out and then they serve the bananas over a rich, creamy vanilla ice cream. So good, it is a marvelous marriage of cold ice cream and hot bananas in the prepared syrup. Lovely way to end the meal. Our stay at the Woodbridge Inn was perfect and we will be back again. Such a great little place to "run away to". Like taking sand from the beach to ensure your return at a future date, Woodbridge Inn offers the visitor a "Walking Onion". From their very own kitchen garden, you are invited to take a handful for use in your own next meal preparation or plant for future use. Sunday morning was overcast and cooler and we are now off to purchase fresh picked apples from a few local orchards. First stop was at R & A Orchards for fresh cider and apples. Got a bag of Winesap's and fresh cider. As I was checking out, I picked up a fresh, out of the oven, loaf of cinnamon apple bread. Heaven, I tell you. Additionally, they had apple cinnamon fudge. Never heard of it so I got a small wedge of this to try. Amazingly, it was not sweet and actually tasted like apple cinnamon strudel. We were still on the search for Arkansas Blacks so we stopped off at Hillcrest Orchards. Parking lot was packed as this Orchard puts on a huge fall festival with petting zoo, clog dancers and live music and fresh barbecue. They have pick your own apples and loads of families were bringing back bushels of freshly picked apples. Granny Smith, Winesap's and Delicious. So many to select from...but we found our Arkansas Blacks. It's not officially fall into my honey can get a bag of hot cider donuts. Hillcrest Orchard offered them hot, out of the fat and rolled in sugar at their restaurant so I purchased two bags, one for my honey and the other for my sister. How good do these look? With apples and donuts and cider, we headed on back home. It was a weekend where I put my corporate world away for 48 hours and just relaxed and enjoyed the best that fall has to offer. I didn't realize how much I needed the time away until we started our adventure on Saturday. There really is nothing like spending time with someone you love.